Discussion in 'Completed Zaps & Swaps' started by AgentR, Apr 30, 2014. 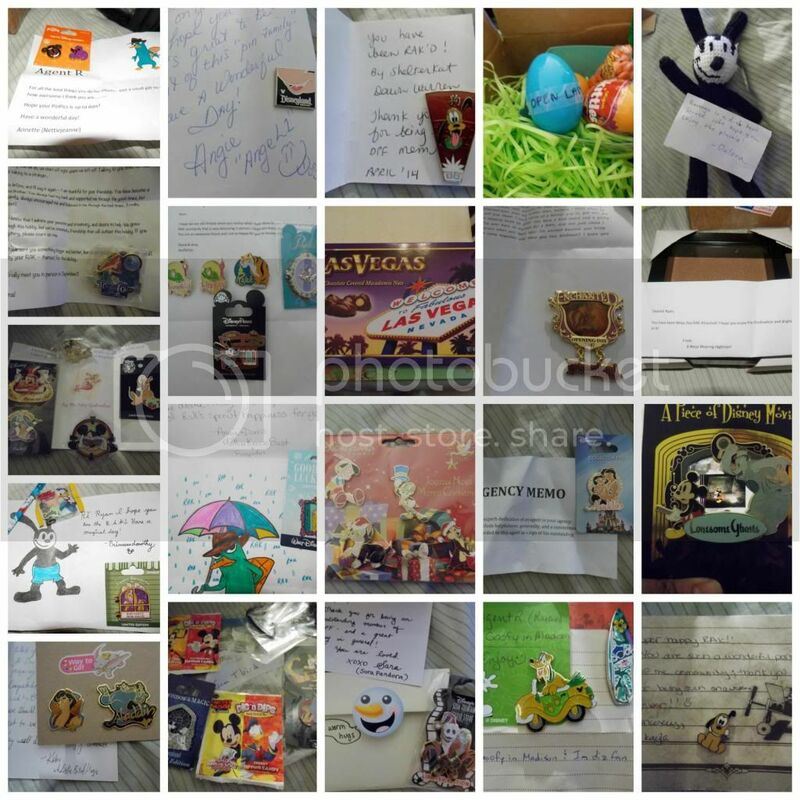 I am so grateful to everyone who had taken the time to zap me pins, drawings, plush, gifts, candy, and positive messages. It means the world to me that I was nominated and that you had taken the time to do this for a random guy like myself. I didn't want to open my pin packages at the party, because I was so immersed in the party and I wanted to focus on the festivities and all the wonderful people I was surrounded by. I went home by midnight, and... I fell asleep. The next morning, I finally open the packages, read everything, and felt so wonderful and blessed to have received such a special gift. I will treasure the kindness from my DPF Family. Hugs to all of you! Yay!! I was so bummed to miss the pin party cause I wanted to see your face. Enjoy the RAK!! Ryan, as I am going through my suitcase I found one more item that should have went to you at the party. It is wrapped in red tissue paper so I did not want to take it in my carry on luggage. So you will have it soon. Sorry for the delay in that one. I was so happy to see your shocked face. Yes shocked is the best word for it. You so deserve it my friend!!! disneycrazee I just got pixelexia, ok? Congrats! I'm not really sure how to describe your reaction...but it was priceless (I had a really good view too lol)! I hope someone took a photo! Yay! It was nice to meet you at the party. Enjoy are those wonderful things, congrats! I think these RAK attacks are so special, clearly you and the previous recipients are very loved by the pin trading community here at DPF and that must be a wonderful feeling. On a side note, who knitted the Oswald? I can't read the name, but it's adorable! I'm so happy you were RAK attacked. you deserve it so much ! you're AWESOME !! Big congrats to you Ryan!! It was soooo much fun watching you receive your RAK in person! Wishing you all the best! And a special HIGH 5 to David for arranging to have this presented in person at the pin bash! WooHoo!! Yay! So happy for you Ryan, congrats! Congrats Ryan! It got SOOOO loud with all the clapping and hooting and hollering when David announced it was you! I bet waking up to all those wonderful little surprises made you feel really, really good! You did an AMAZING job!! Way to go!! And Ryan, I am so thrilled you liked your surprise! Z and I had fun setting up your little basket! Congrats!! You deserve all this and more!